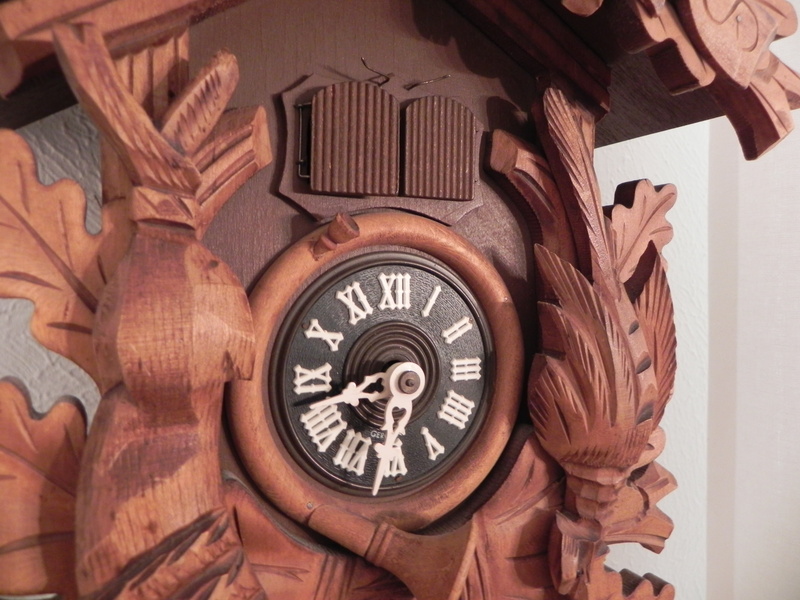 Did you know that cuckoo clocks are very temperamental about being moved? I sure didn’t! When I first got this clock from my mom a few years ago, we just put it in a box and I took it home. A short time later, I took it to a clock repair shop to have it serviced and cleaned. They informed me that you should ALWAYS prep your cuckoo clock for moving. So…when the time came for us to move to Texas, I took my little cuckoo clock back to them and had them prep it for moving. However, when I hung it on the wall, it worked for about five minutes! And there on the wall is where it has hung for the last 19 months! Not working! That is…until yesterday. I found myself a troubleshooting website! (I’m always looking up how-to’s online) It walked me through what to look for and….viola! My cuckoo clock is ticking and cuckooing away! It’s running a little slow, so I’m still working on getting that part adjusted. But hey! I’m just thrilled that it’s been tick-tocking since yesterday and hasn’t stopped! This entry was posted in DIY & Crafts and tagged cuckoo clocks, diy. Bookmark the permalink.